Merchant Ivory productions, one of the oldest indie film companies, has produced many smart, beautiful pictures on a small budget: Maurice, Howard’s End, The Mystic Masseur, The White Countess, etc. 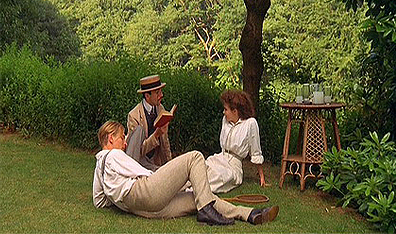 My personal favorite is A Room with a View from 1985; it was shot in Florence, Italy and county Kent in England. 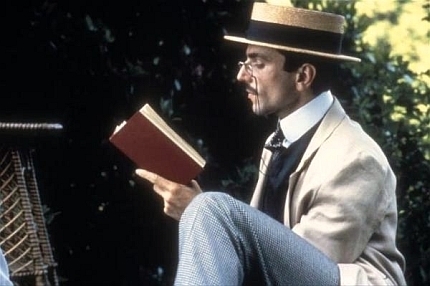 It is based on a book by E.M. Forster, regarded as one of England’s most tolerant, sensitive writers. I have the 2 disc special edition DVD; the film was digitally re-mastered in 2003. Helena Bonham Carter was an unknown actress before A Room with a View. Sadly, James Ivory’s business (and life) partner, Ismail Merchant, passed away last year. At the opening of the film, Lucy Honeychurch (Bonham Carter), a British upper-middle class young lady, is on vacation in Italy with her cautious/irritating single aunt, Charlotte Bartlett (Maggie Smith). The ladies happen upon Lucy’s pastor from home, the Reverend Mr. Beebe (Simon Callow). There is also a romance novelist, Eleanor Lavish (Judy Dench) at the hotel. Lucy is especially struck by a very unorthodox father and son- Mr. Emerson (Denholm Elliott) and George (Julian Sands). Charlotte wants to stick to what the guidebooks say, but Ms. Lavish convinces her to be more independent. Though the Emersons are British, they have their own way of looking at the world; they speak what they feel. Lucy is surprised by, but also curious about the handsome, yet brooding George. Through circumstances, or fate, Lucy and George are thrown together. When Lucy gets home to England, she gets engaged to wealthy, uptight Cecil Vyse (Daniel Day-Lewis). You can suppose they had been courting for a long time. Her family, including little brother Freddie (a very young Rupert Graves), think Lucy can do better. Lucy is uncertain about her choice, too. Into their quiet neighborhood come two new tenants- the Emersons! I can’t believe this movie came out 23 years ago- it always looks fresh and new whenever I see it! At first, it comes off as a simple love story. But when you look deeper, you see the conflict between the natural (an individual’s true feelings/desires) and artificial (British society of the early 1900s). Howard’s End (starring Emma Thompson, Anthony Hopkins, and Bonham Carter) and Maurice (starring the young Hugh Grant and James Wilby) also deal directly with this conflict. The two men Lucy must choose between personify this conflict. George is quiet and mysterious at first, but later we see he is full of life and very real. He’s blunt in contrast to the other people Lucy is familiar with. When he moves to Kent, he becomes a friend to Freddie. In one hilarious scene the two young men (along with Mr. Beebe) go bathing naked in a pond. George is comfortable in nature; he doesn’t know how to be not real, as his father points out to Lucy in a crucial scene. I really enjoyed the nuanced performances of Maggie Smith and Daniel Day-Lewis in this film. They seem like the annoying “bad” guys at first glance, but they have moments where they get to show their complexity. All the characters get their moments to shine in this film; I wouldn’t expect less from Merchant Ivory. Bonham Carter is strong (as always); I don’t think I’ve ever seen a weak performance from her! Here she gets to be a likeable “traditional” heroine, not a cheater or oddball- that’s interesting to see. Check this film out ASAP!!! This imaginative romantic comedy (released in 1991) was recently deceased director Anthony Minghella’s first film. 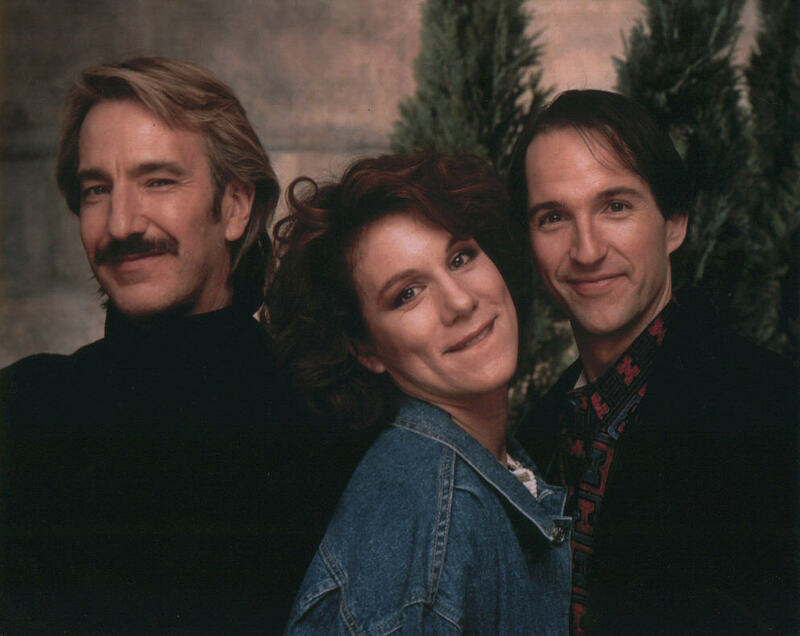 It is a terrific film, starring theatrically-trained actors: Juliet Stevenson, Alan Rickman, and Michael Maloney. Minghella also did commentary for this film; he admits that he was a technical novice, but relied on a team of experts. Most of this team continued on to work with the director on other films, including The English Patient and The Talented Mr. Ripley. 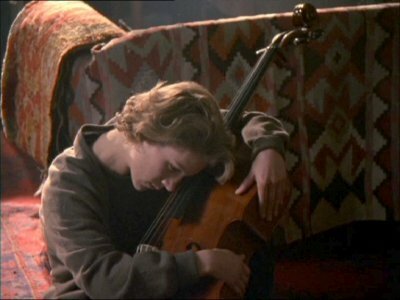 Truly Madly Deeply involves Minghella’s interests, friends, and sensibilities. Nina (Juliet Stevenson- Mrs. Elton in Emma; Keira Knightley’s mom in Bend it Like Beckham) is a charming, intelligent woman (around 30) who works at a language institute in North London. (Nina is fluent in Spanish.) Her boss/friend (Scottish actor Bill Patterson; he’s in Amazing Grace) is worried about her because she’s “not having any fun” these days. Her older sister is worried because Nina’s flat (or “apartment” as we say in the US) is falling apart and has a mouse (yikes!) She shrugs off their concerns. 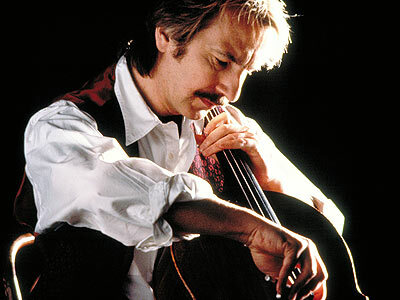 Nina meets regularly with a therapist because she is having a very difficult time getting over the recent death of her (cellist) husband, Jamie (Alan Rickman from Robin Hood– note the mustache- and Sense and Sensibility). She is sad, but also angry, as is revealed in a very intense scene. (Juliet Stevenson is not afraid to reveal messy emotions.) Nina busies herself with repairs on her flat with help from a romantic Polish immigrant (Titus). Then one day, Jamie appears in the living room! Jamie is not like other movie ghosts you may’ve seen. He complains constantly about it being freezing cold in the flat; Alan Rickman chose to wear a long black overcoat the entire time. He invites other ghosts (from various time periods) to watch classic films, play music, and redecorate Nina’s place. Getting off the bus one day, Nina runs into Mark (a man who she saw at a local restaurant). She decides to go out with this (real life) man. Check out Truly Madly Deeply to find out what happens next! Visually, there are no tricks or bells, but the acting is superb! Even the small parts are done very well. Minghella points out that these actors aren’t the “typical romantic leads.” Stevenson and Rickman (who worked together before) have the kind of chemistry and comfort with each other that can’t be faked. Nina and Jamie seem like a real, passionate couple with a shared history. From the moment he meets Nina, there is a twinkle in Maloney’s eyes- we know that Mark is interested in her. I especially liked how the two men were quite different: Mark is positive and smiling, while Jamie is sullen and intense. Will Nina choose to live life again or remain in the past? Before last week, I never knew about this terrific comedy film by famed director Billy Wilder. I picked it up from The Strand bookstore in Union Square because I absolutely loved Jack Lemmon (and co-star Tony Curtis) in Some Like It Hot. 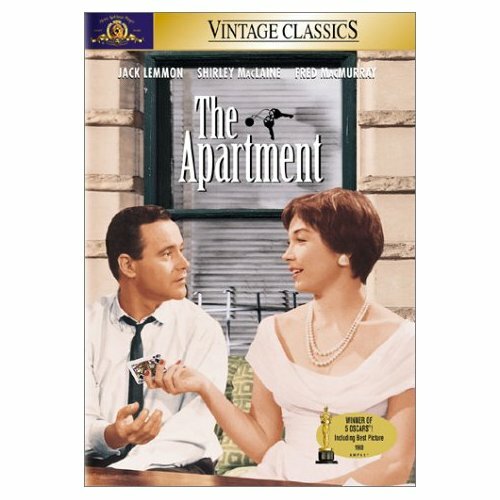 The Apartment won 5 Oscars in 1960, including the most-coveted one, Best Picture! The stars of this (black and white) film are Jack Lemmon, Shirley MacLaine, and Fred MacMurray. 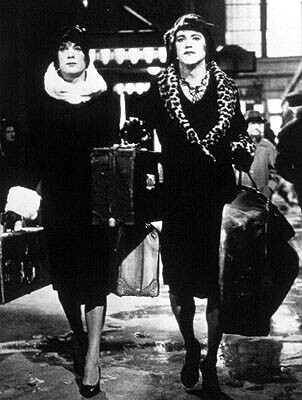 Unlike Some Like It Hot (another Wilder comedy where the main characters dress in drag to escape the mob), The Apartment is a more serious, true-to-life type of comedy. There are light and dark moments relating to ambition and romantic relationships, among other themes. Jack Lemmon plays C.C. (Bud) Baxter, a single, ordinary “nebbish” (as his neighbor says) working for a huge insurance company in NYC. But Bud has an advantage over his co-workers- he’s renting out his apartment to four men (working above him in different divisions) who want a little “ring-a-ding-ding” outside their marriages. These guys, including a hilarious young Ray Walston (known to modern audiences from his serious TV roles), say this will put Bud on the fast track to success. Bud has no problem with them having fun on the side, until it hits him personally. The audience can clearly see that Bud has an interest in one of the elevator operators in his office building, Fran Kubelik (a very young Shirley MacLaine). He thinks she’s “a nice decent girl” and goes out of his way to compliment and chat with her whenever he can. When he gets a big promotion, he asks her out on a date to the theater. He got free theater tickets from the head of personnel, Mr. Sheldrake (Fred MacMurray). But things are not as they seem with the sweet, friendly Ms. Kubelik. I’m not going to reveal more about the plot of The Apartment, because I want you all to discover the surprises on your own. Jack Lemmon does a great job in this film- he can convey conflicting emotions with subtlety. He can do physical comedy, and his eyes are very expressive. Shirley MacLaine will remind you of Renee Zellweger; she can be vulnerable and tough. Young single, working women will relate to the character of Fran (at certain points in the film). Fran wants to be loved, but keeps falling for the wrong kind of men. This is a must-see film for anyone looking for a smart, thoughtful comedy! This past weekend, I saw The Dark Knight. I absolutely LOVE Christian Bale’s work, and I hadn’t seen Aaron Eckhart for a while. I do agree with the reviewers who said this film is dark! It is a movie about pairs- “the dark knight” could refer to billionaire businessman Bruce Wayne (Batman) and to DA Harvey Dent (who becomes Two Face after a tragic incident). The Joker (Heath Ledger’s last role, sadly) is also looking to become part of a pair- he’s a “freak” who wants someone else to play with- Batman. The audience also doesn’t know who will pair up with ADA Rachel Dawes (the always capable Maggie Gyllenhaal)- Bruce or Harvey. It’s a very entertaining film; you can expect SOME surprises in this film! The Joker is nothing like Jack Nicholson portrayed him! As the ever-loyal and wise butler Alfred (Michael Caine) points out, “some criminals can’t be bought” and do things “just because they can.” These men CAN’T be understood! Heath Ledger makes The Joker PRETTY scary- he’s like a force in Gotham. (If Ledger DOES get the Best Supporting Actor Oscar, it’ll be WELL deserved!) The make-up, clothes, walk, and especially menacing tone he has will get your attention. He has varying stories about how he got the scars on his face. What is his motivation? (Does he even have one?) And WHO is he really? Even Batman is perplexed this time! Can a police department function when some of its cops have been corrupted? How far will people go to preserve their lives (or the lives of their family)? The Joker creates an experiment involving two ferries, but I won’t give it away. (It was the MOST interesting part of the movie for me!) Check out “The Dark Knight” if you’re in the mood for a dark, fun, and intelligent action movie! This past week, I saw some tennis live (for the FIRST time)! My yoga teacher (Astoria Sports Club) mentioned last Monday that the first 5 days of the US Open are FREE!!! I was so surprised; no one had ever told me that before (and I’ve lived in NYC more than 3 years). It must be a closely guarded secret, b/c a LOT of people don’t know about it. I had time to go on Wednesday afternoon, Thursday (after teaching my SAYA! SHSAT class), and Friday (all day). I had a GREAT time, and chatted with a few people (some were knowledgeable about tennis and some just wanted to check out something free)! Below are some pictures and comments from the Open. She was on the practice courts w/ her hitting partner. I didn’t know who she was until someone (much more knowledgeable re: women’s tennis) pointed that out. I looked her up; she’s currently ranked #2 in the world! My mom was VERY impressed when I told her. Todd Widom – He’s got the flaming red hair (and a bit of temper, too). His build and style are similar to that of Ryler De Heart (see below). Michael Yani – This wiry 27 y.o. player is Chinese-American; he needs to work on his serve (a weak spot). He is light on his feet and very focused. Robert Kendrick – He’s tall, blonde, and resembles David Beckham. Kendrick (28) and his wife have been spotted hanging with celebs, too. But Kendrick should be lauded for his game, and GREAT presence on the court. Kendrick’s serve is great, and he has a LOT of stamina- this makes him a VERY popular player. Aisum-ul-Huq Qureshi – This 28 y.o. family man (I saw his wife and baby) hails from Pakistan; his father was also a tennis player. He’s scrappy, fast, and not afraid to reveal his personality (talks loudly to himself during games). He already has many fans ALL over the world! Bjorn Phau – His unusual looks come from his Swedish mom and Indonesian dad. He’s well-rounded with a calm demeanor. Many people were interested in seeing his skills; in Sweden he’s a big star. Thiago Alves – Loud (he yells out with EACH shot he makes), energetic, and agressive are some words to describe this Brazilian. He takes his time before serving, then struts across the court with confidence. The leaps he made reminded me of Agassi, not to mention his build and (slightly wild) hair. Is it REALLY fair that some people look THIS good? Seriously, this (smokin’ hot) guy was born to play tennis; you’ll sense it when you see him in action. He’s tall (6’3″), has powerful legs, and moves across the court with agility. “Beautiful,” “amazing,” and “wonderful” are some words spectators exclaimed while watching Hartfield. He makes the game fast, tough, and VERY fun! When Hartfield serves- watch out, baby! De Heart defeated him, but he had to pull out all the stops to do so. I cheered the entire time for De Heart, but Hartfied is AWESOME to watch as well! Something about him made me want to root for this guy… He’s German, only 24 y.o., and has many good qualities. His backhand is lovely to watch, he can spin the ball well, and his serve is (usually) strong. He shows TERRIFIC energy at times, too! His slim build enables him to move around the court fast, as does his height (6’1″). Petzschner was wearing a plain white shirt, so I don’t think he has any endorsement yet. He wears ankle supports (perhaps in order to prevent injury). At times, he shows impatience, frustration, and anger. He questioned several calls, and asked for clarfications. In one game, he hit his racket against the ground (very hard) and bent it! Other times, he swore (English) and called out (probably not-so-nice) things in German. I thought he was fun to watch! Another point of contention here- not afraid to question authority. Unfortunately, Petzschner was defeated by Thiago Alves this past Friday. He played VERY well the previous two days (I saw three of his games); Alves was a little more agressive. I hope Petzschner will build upon his skills, and (hopefully) learn how to manage his negative emotions. If he does this, he can take on the world’s best! Giovanni Lapentti of Ecuador after his “medical break” (a trainer and official spoke with him). His legs were hurt (obviously) but he chose to continue with the game. The crowd was TOTALLY behind him! Before he continued, he bent down to test himself. Slowly, he readies himself to serve. Earlier, he told the referree that he would do all he could. Minar won the game because Lapentti couldn’t return all of his serves. The two men paused and spoke for several moments at the net. Minar was noticeably concerned about his opponent; Lapentti patted him on the cheek. He’s a REAL fighter- did all that he could under the circumstances. Here Lapentti acknowledges the crowd with a big smile. I hope he gets better soon!! !